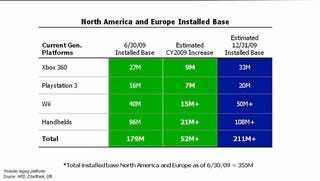 During Activision Blizzard's conference call annoucning its second quarter results today, the company shared its best guess for the North American and European console market circa 12/31/09. The biggest change? Blaming the economy, the company lowered expectations for console sales in 2009 by one million units.